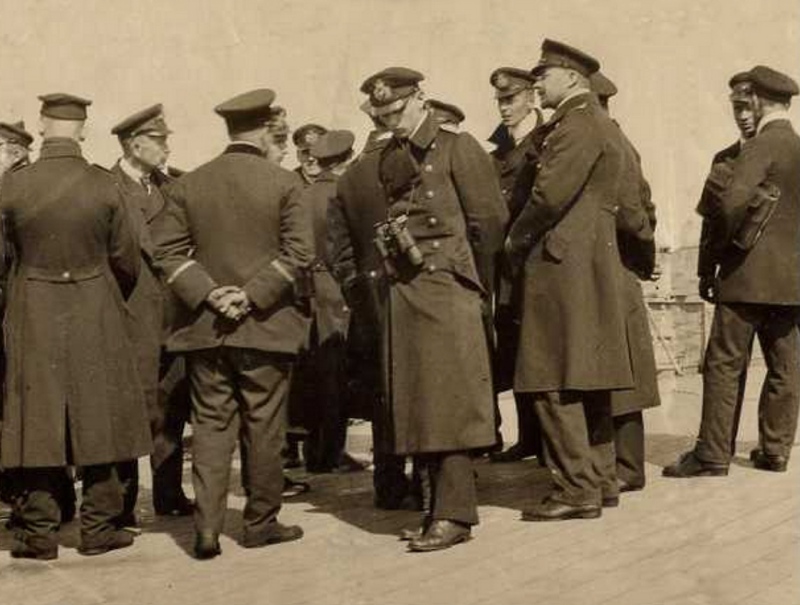 Reuter’s plan to scuttle his fleet evolved, in great secrecy, slowly. 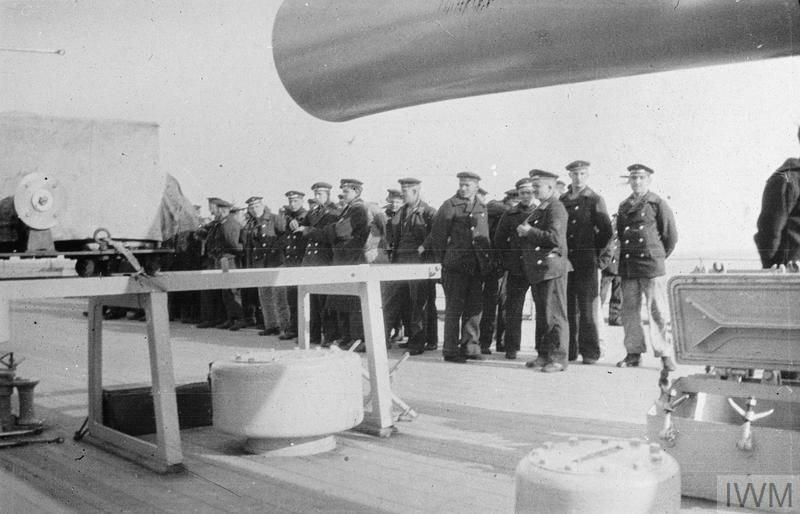 He most feared treachery from revolutionary sailors who wanted an end to the war at all costs and saw the scuttle as a threat to peace. 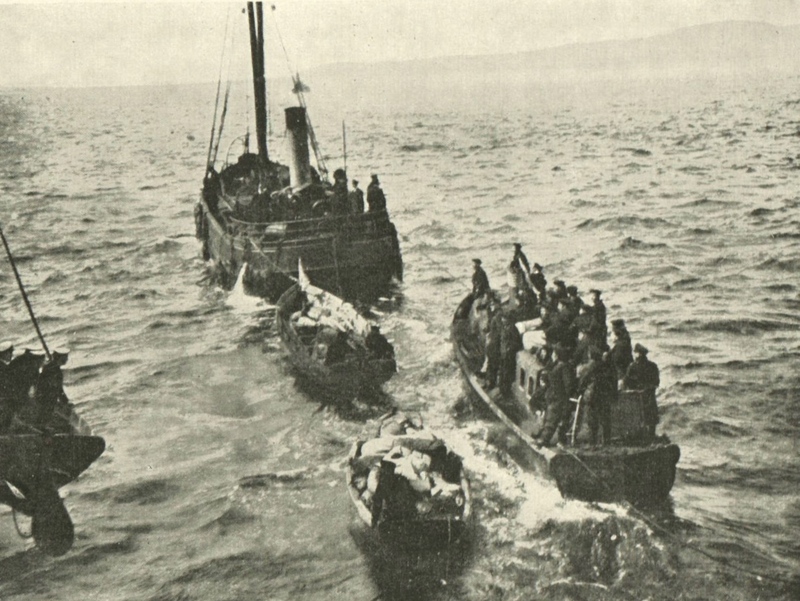 On 17 June, his written orders were distributed – unwittingly by the British guard trawlers. 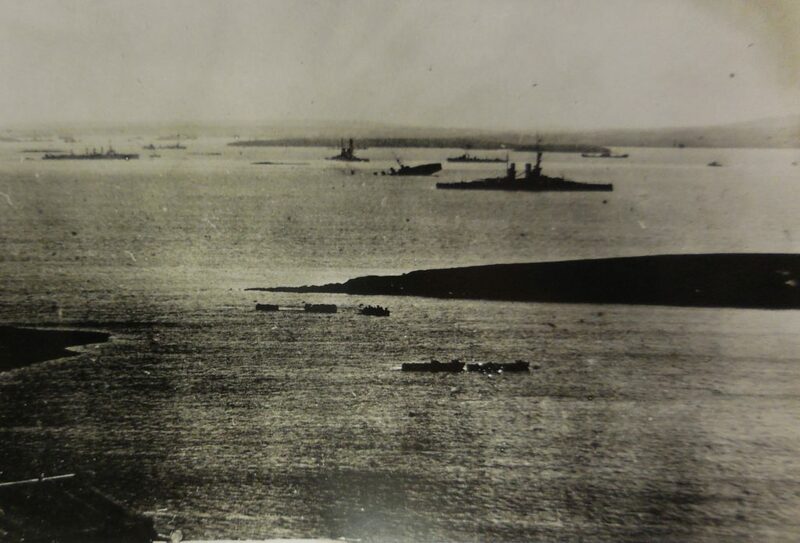 21 June 1919, Johannistag, midsummer’s day, started like any other. Ships were alerted to watch his own flagship, the Emden, for a seemingly innocent signal – ‘Pargraph eleven, Confirm’ (Paragraf elf, Bestätigen). 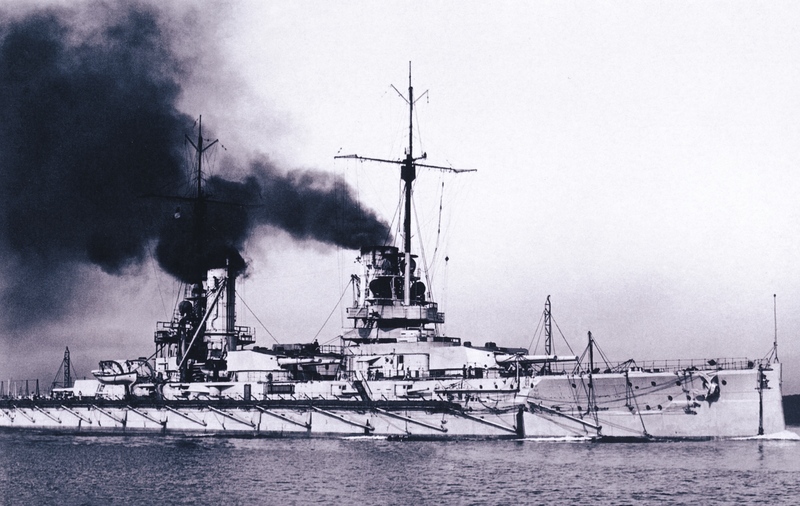 Von Reuter moved his flag to the SMS Emden after he had lost patience with the constant troubles on SMS Friedrich der Große. 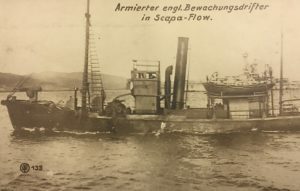 By day’s end, the German Fleet would have succeeded in sinking 54 out of the 74 ships interned at Scapa and sinking more steel in a few hours than ever in history. The signal was given at 11:00. By 12:16, British shore parties are alerted when a strange sound is heard: the tolling of the ship’s bell on Friedrich der Große as she started to list. 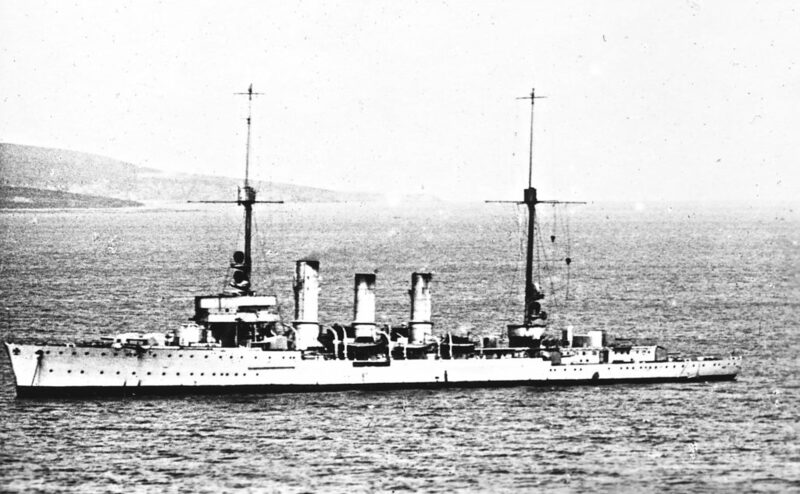 Half an hour later, König Albert followed. The calm of the Flow now became bubbling, seething pandemonium. 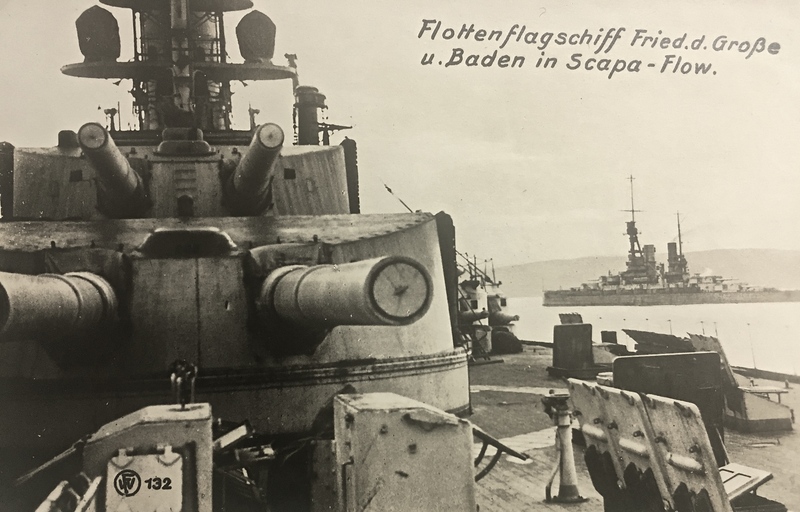 As the British 1st Battle Squadron came back, Bayern was in her final moments. 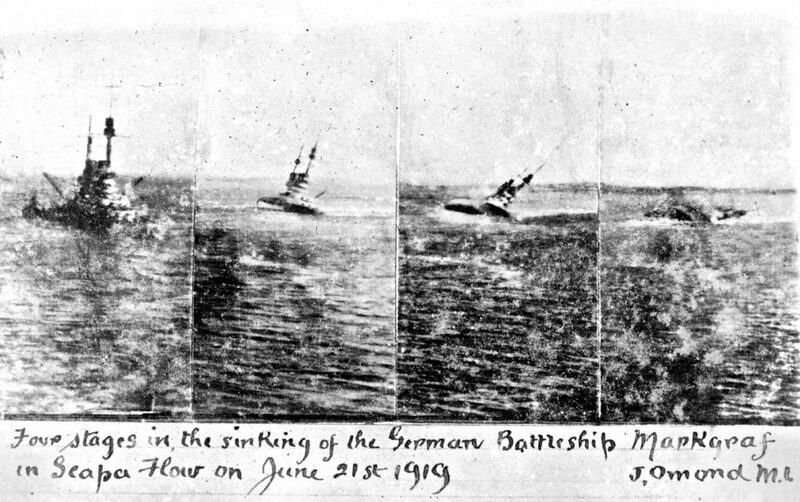 The photo of her listing, taken by Burrows from her stern, would become the iconic photo of the day. 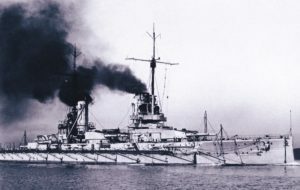 The German battleship Bayern sinking by the stern. The photo was taken at 14:00 by C. W. Burrows who was sent by Rear Admiral Prendergast to record the sinking Fleet. 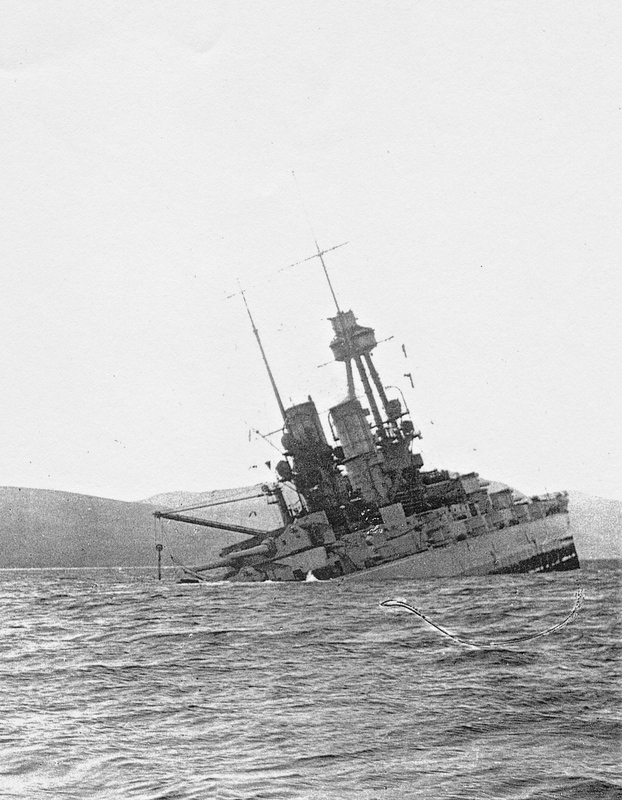 At 16:45, the König-class battleship, Markgraf rolled over and sank. The final sequences of her slow death were caught remarkably on a plate-camera. 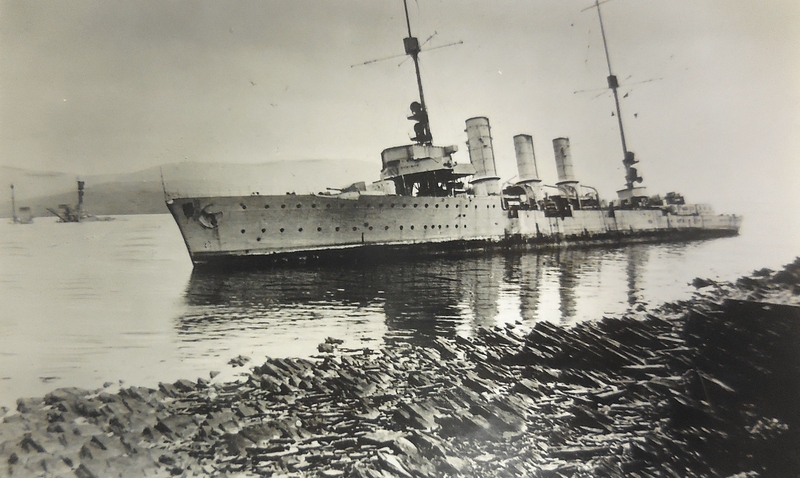 Another series of photographs captures the scene from Houton and shows a light cruiser, the Karlsruhe, slowly sinking. 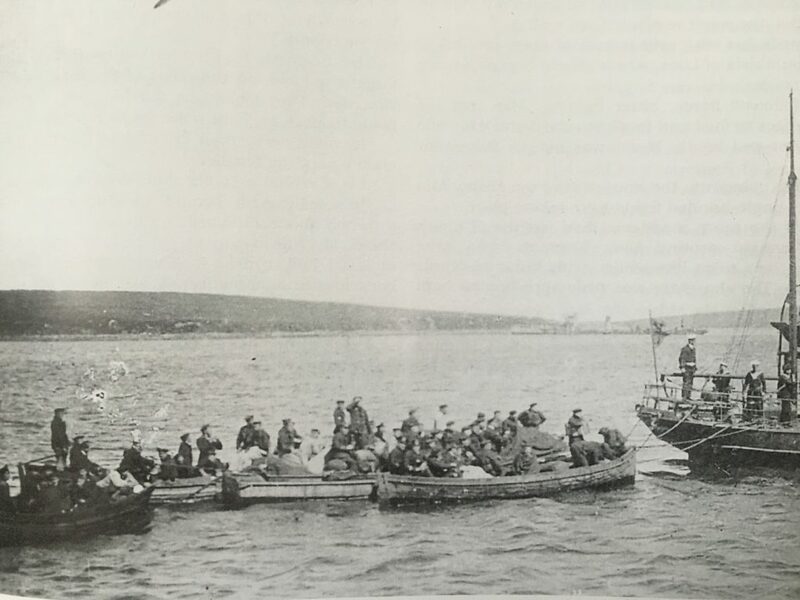 The British had left the ships practically unguarded to perform a torpedo practice. 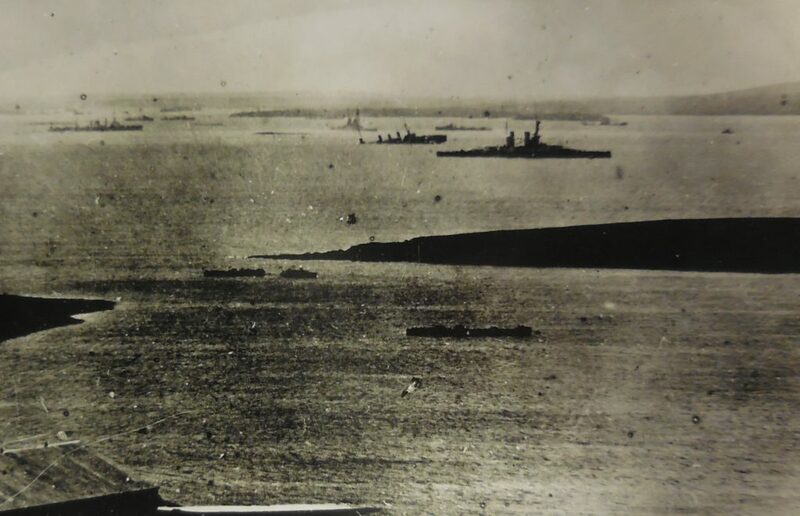 Too late, the first four destroyers came racing back at 14:30. German sailors had opened every possible inlet to sink their ships as fast as possible. The British could do little to turn back the inevitable and everything was done to prevent them doing so: turncock wheels had been thrown overboard, acid or sledge-hammers used to destroy the threadings. On the Flow, there was pandemonium. 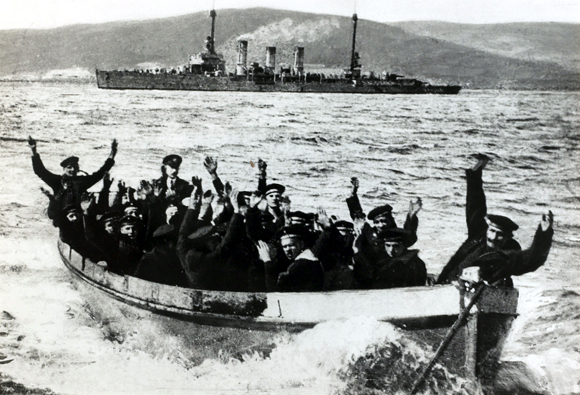 German prisoners from scuttled ships on the quarter-deck of HMS Ramillies (Courtesy of Imperial war Museum). 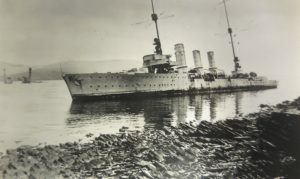 The British managed to tow a few ships onto the shores, including Reuter’s own, some light cruisers and destroyers and the Baden. 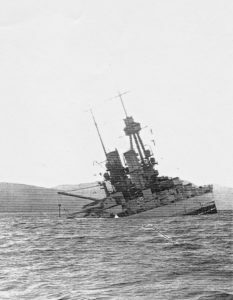 What the Royal Navy had failed to accomplish at Jutland, in a few hours in the cold waters of Scapa Flow, the German Navy had done. Its annihilation. 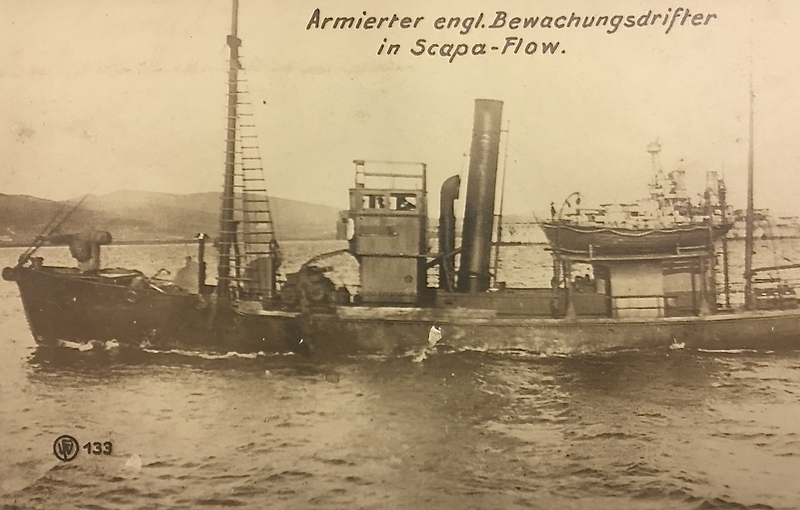 At the end of the day, the pride of the German Navy lay on the floor of Scapa Flow and the day had cost the lives of nine German sailors. 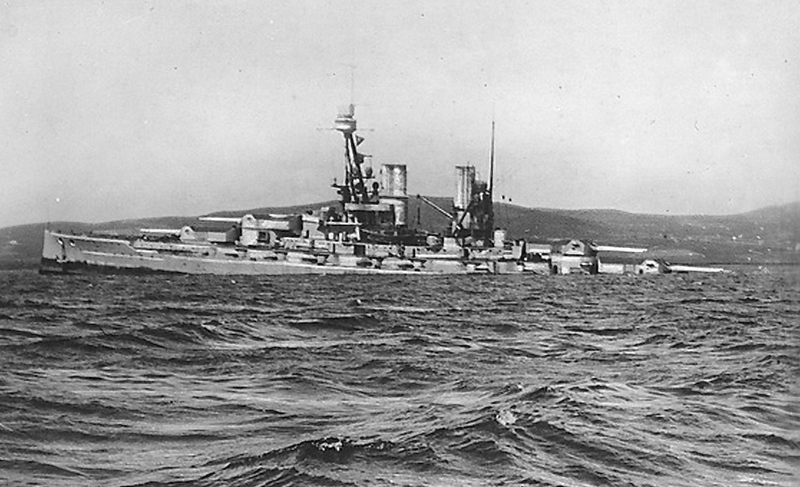 The last fatalities of the First World War. The only witnesses to an event with worldwide impact were school children on a school outing. 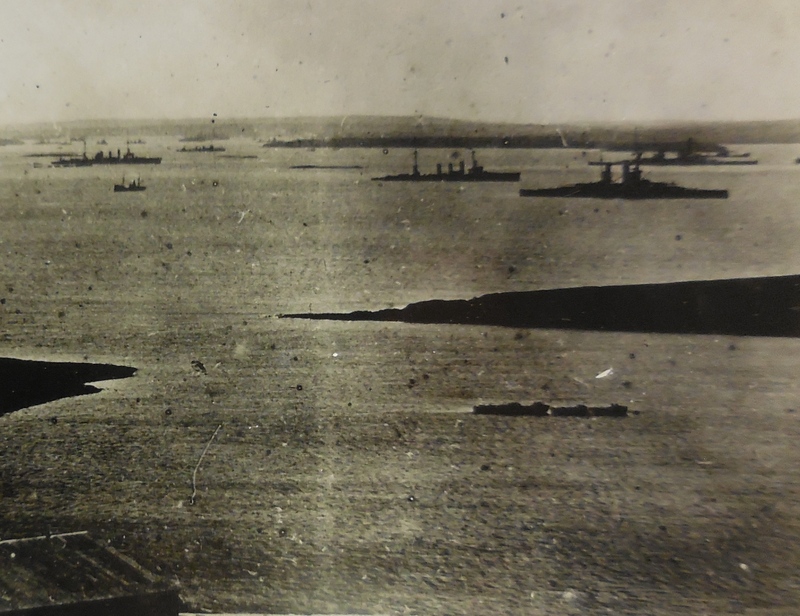 At the end of the day, all that remained visible were upturned hulls, beached ships and Hindenburg‘s funnels.